New criteria required to define LV dilatation ! Human heart is a compact elastic organ . We know elasticity is lost when it is stretched beyond a point.This is what happens in dilated cardiomyopathy .When the heart muscle fibers stretch too long from the baseline it loses its ability to contract and relax efficiently.In fact , after a cut of point even if it comes the original length the elastic fibers are fractured and suffer from irreversible damage. Among the systolic vs diastolic dimension it is the diastolic dimension that becomes important in defining dilatation. When do you say a ventricle is dilated? Any of the above can be right. The normal human ventricle measures between 35 to 55mm in diastole . Currently accepted definition for enlargement of heart is EDD of 56 mm and above. Some believe in a more strict criteria of 60mm. A man with 35mm EDD can increase 20mm ( ie 60 % ) from of his baseline and still be labeled as normal LV dimension ! . If the above patient is destined to develop dilated cardiomyopathy his heart would begin its final journey slowly but surely ( from 35 mm ! ) . So , according to current criteria we can diagnose DCM only after it travels the half way towards hell . What a way to define DCM ! Be cautious LV dimensions can fool you . . . If the EF is low and symptoms develop early , one may recognise the above entity ( at least erroneously !) as non dilated cardiomyopathy or RCM. We need to stress the importance of baseline LV dimension in defining DCM . It is proposed from this site , an increase of 25 % and above from baseline can be included as an additional criteria for LV dilatation . This could help us understand the early muscle dynamics in DCM. How to diagnose early DCM ? When does the EF begins to decline in DCM ? What is the relation between EDD and EF %? Is there a overlap between non dilated cardiomyopathy , RCM and early phase of DCM ? The conundrum called cardiomyopathy ! How is DCM different from RCM ,NDCM and MDCM ? This article tries to evoke some thoughts about why LV dilatation is central to the understanding of cardiomyopathy. Even as we do not have a clear answer to the above issue , we recognise left ventricle muscle can hypertrophy, progressively dilate , transiently dilate, fail to dilate , regressively dilate or hypotrophy .These changes can be dynamic and heavily influenced by hemodynamic and local pathologic factors like fibrois, interstitial proliferation etc. Meanwhile , the pharmacological , surgical /catheter injuries we inflict , modifies the muscle behavior in a positive or negative manner. In this back ground , we have found a new entity called NDCM . 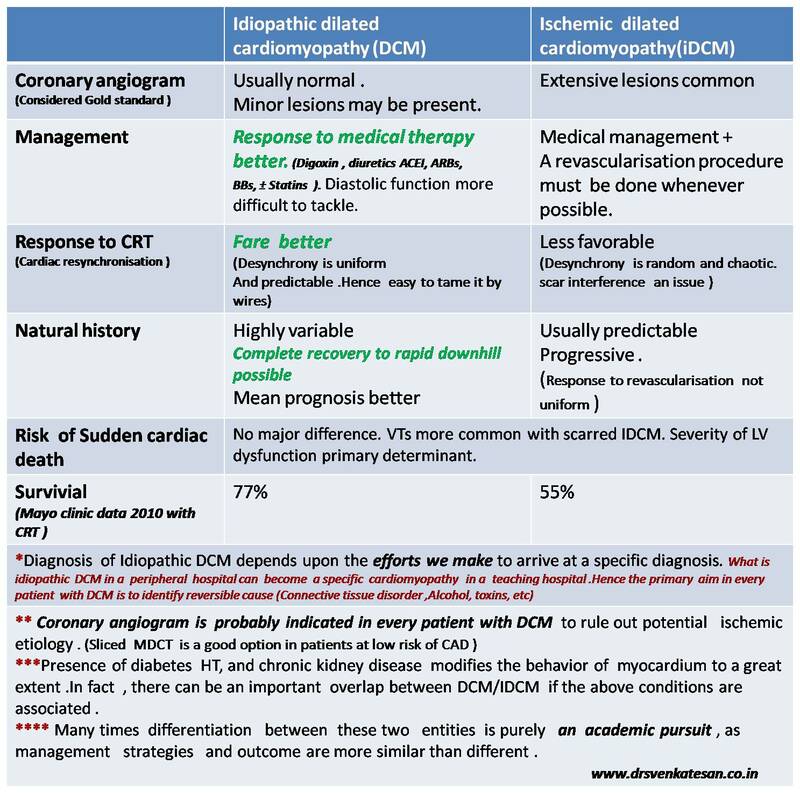 Apart from DCM, a newer form of cardiomyopathy is being recognized .This is often referred to as NDCM (Non dilated cardiomyopathy) .Global systolic LV dysfunction with normal LV dimension.This a similar to the terminology MDCM (Minimally/Mildly dilated cardiomyopathy where LV dimension do not increase beyond 15 % upper limit of normal ) . This is seen in CKD and diabetic individuals.Atria may be enlarged .Diastolic dysfunction may co exist. It is no surprise, this entity closely mimics RCM. But in RCM LV systolic function is not greatly compromised till the late stages , while NDCM it begins with systolic dysfunction. This is the only difference .There can be overlaps . MDCM was reported in 1990 . Keren gave a excellent insight about the condition , It is unfortunate it failed to take off as a popular clinical entity . Cardiologists are argued to use this term liberally in their clinical practice . Cardiology is not that simple as one would like to ! The two components of cardiomyopathy ie LV dilatation and LV dysfunction can be temporally dissociated one may precede the other. To complicate the matter further, one of them may not manifest at all ! Few , still consider many of the RCMs and NDCM are one and the same entities that present in different time frames in their natural history. In dilated cardiomyopathy which chamber dilates first ? Logic would suggest , the first chamber to dilate in DCM should be the left ventricle because it is facing the direct load of systemic blood. But we also know , whenever LV is stressed , left atrium comes to it’s assistance . Left atrium does this by total self sacrifice ( by all means!) increases it’s force of contraction, elevating it’s mean pressure or even increasing it’s rate (AF) . Like most other critical questions in cardiology , the factors that determine LV dilatation in DCM , is also poorly understood ! Is it the after load ? Is it the muscle mass ? or it’s turgid or flabbiness ? Is it the interstitial integrity? When the issue is complex , it is usual to make the the unknown genetic defects , the scapegoat ! If the LV of a DCM patient refuses or resists dilatation what might happen ? Is it good or bad for the patient ? Here is a catch . A LV that does not dilate obviously should be be good for the patient is in’t ? Medicine is not that simple. So now answer this question : Which chamber dilates first in DCM ? The answer must be 3 . Why recognising this sequence of chamber enlargement in DCM is important ? It gives us an opportunity to assess the dominant mechanism of LV dysfunction.There are reports , where some DCMs have more diastolic dysfunction than systolic dysfunction .This will have important therapeutic implication.Further , many of the infiltrative disorders of LV can have features of both DCM & RCM . When a RCM begins to dilate it is usually a harbinger of terminal heart failure. But, it need not be always true . A small restrictive LV , when dilates , may acquire a slightly improved diastolic properties , as the LV becomes more placid . And , if it happens the LA size may regress. The role of LV restriction devices like, Acron mesh, Dor procedure, plication in refractory DCM is not well defined. All these modalities actually adds a small dose of diastolic dysfunction in these patients who have grossly dilated ventricles. This fact is very important , as presence of any preexisting significant diastolic dysfunction in DCM makes the role of LV restrictive devices and surgery a big question mark ! 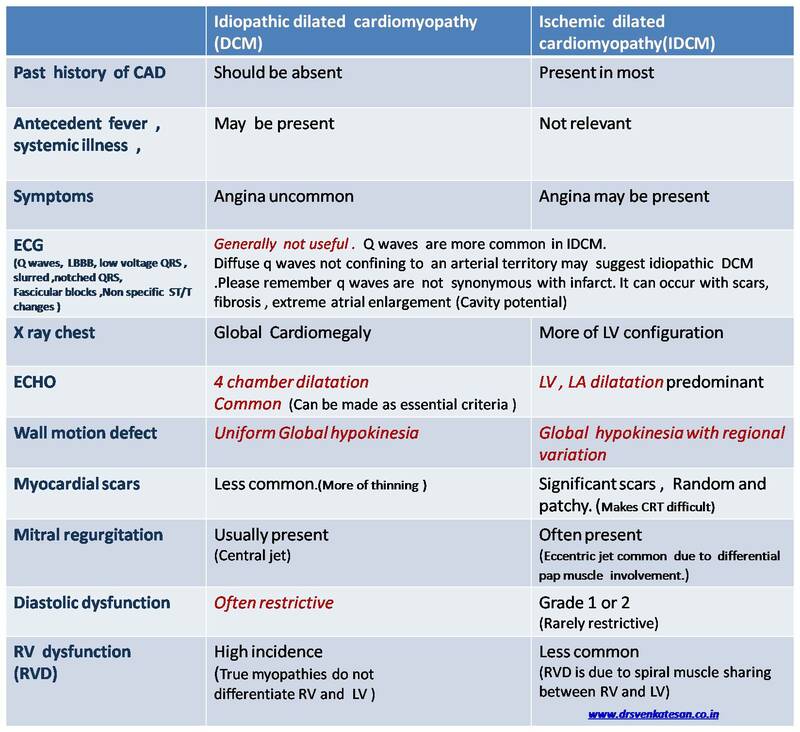 Non dilated cardiomyopthy : An under diagnosed entity ! How will you refer to a ventricle which is not dilated but still has severe global contractile dysfunction ? But there is large group of pateints who do not show any of the above features and still have global hypokinesia contractile dysfunction. this group has been largely ignored .It could constitute up to 25%of all cardiomyopathy.there can be some overlap between non dialted cardiomyopathy and RCM. Can mitral valve act as a safety valve in patients with dilated cardiomyopathy ? Competence of mitral valve is vital for proper hemodynamics of heart .A trivial mitral regurgitation ,is observed in nearly 10-20% of normal population detected by doppler echocardiograpgy .This is other wise clinically insignificant. In fact , it is expected , the sonographers do not report this, as it might increase the patient anxiety. Can a mildly incompetent mitral valve be a hemodynamic advantage ? Left ventricle , physiologically can have only one exit, namely LVOT and aortic valve.If there is normal impedance , at this level (LV after load ) it is refered to as physiological .In disease states , as in cardiac failure there is raised after load or LV wall stress.this makes the LV struggle to pump blood into aorta.The more the dilatation the more the wall stress (Laplace law). more the wall stress more the after load. The main principle of management of cardiac failure for decades has been promoting LV inotropism .Now we have realised this is fundamentally a wrong concept, (Except in acute heart failure). Hence the main option available now is to reduce the after load , ACEI do that most effectively and proven to improve survival. What is the effect of trivial or mild MR on LV after load ? It is a hemodynamic fact for MR to increase LV contractility and Dp/Dt due to a relative reduction of after load. In patients with cardiac failure , even a mild improvement in LV contractility can give a symptomatic improvement . Can mitral valve act as controlled safety valve allowing only a trivial or mild MR ? This may be difficult . But it happens naturally in many of our patents in cardiac failure . We have found, patients with DCM with mild mitral regurgitation tolerate excercise better than patients who have very competent and rigid mitral valve.It is presumed a mitral valve which gives in a little bit , decompresses the LV with a symptomatic benefit.But if the MR , is occurs in an eccentric path or it results in significant volume burden the potential advantage becomes a liability. While milder forms of MR are well tolerarted , when it occurs acutely ( even if it is mild) , it can be dangerous and result in sudden pulmonary edema .This usually happens in acute MI or infective endocarditis etc. Minimal or mild mitral regurgitation without any significant volume overloding in some of the patients with dilated cardiomyopathy could bring a hemodynamic advantage . We will report the results of the ongoing study about the impact of presence /absence of mild MR on the 6 minute walk test in patients with dilated cardiomyopathy.